14 operating rooms, 90 exam rooms, lab and radiology spaces, bronchoscopy rooms, teaching spaces, conference rooms, staff offices, central receiving, and a parking garage to support 1300 cars. 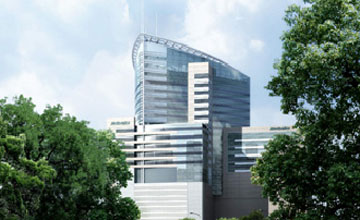 Profile: Located in one of the largest medical centers in the world, the new 26-floor Methodist Outpatient Center, one of the largest buildings in the Texas Medical Center dedicated solely to patient care, and is located across the street from The Methodist Hospital. The Methodist Hospital System expects more than 310,000 outpatient visits per year at the Center, which houses nearly all of The Methodist Hospital's outpatient services, including orthopedic surgery, cardiovascular imaging, radiology, cancer care, weight management, and wellness. Services: DataCom Design consultants worked closely with the Methodist Hospital System staff to establish a technology vision for the facility and a robust technology infrastructure. Services included voice, data, audio, and video systems, Nurse Call/Code Blue, CATV, and a wireless LAN overlay that supports the extensive short and long-term needs of the facility well into the future.